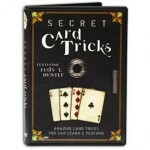 Learn over 30 Secret Card Tricks on this instructional DVD with expert card magician Rudy T. Hunter. Rudy will perform and teach you these amazing card secrets every step of the way. This DVD not only contains easy to learn card tricks for the beginner but also contains tricks for the intermediate card enthusiast.